Than you for your kind words! The game is based on the Unreal Engine! The core of the game runs on C++ and the UI runs on Blueprints which is an engine specific, visual, node-based, scripting language. Das klingt super! Ich arbeite in der Zwischenzeit an gegnerischen Panzern ... die sollten das Spiel noch ein wenig spannender machen! Thanks again for your kind words! 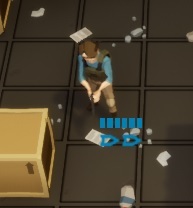 I hope to develop a good inventory system that makes exchanging items between units easy. I am also thinking about adding the possibility of using the mouse wheel to scroll through alternative paths to make sure that you will or will not pick up a certain item on your way. Itch.io has a build in functionality in the top right corner that enables you to follow my game in order to receive a notification when I publish an update for the game. You should also have an option to leave a rating for my game - this would greatly help me out! would you like to cover my XCOM / FTL hybrid?